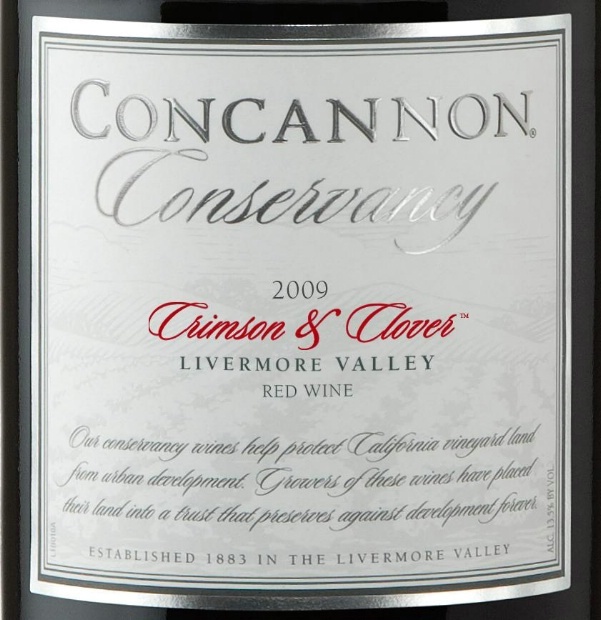 Wine Review: 2009 Concannon Vineyard Conservancy Crimson & Clover | Wine Splash! We don’t think it’s possible to dislike a wine from Concannon Vineyards when the predominant grape is Petite Sirah. The father of America’s first Petite Sirah is Jim Concannon and his experience with growing excellent Petite Sirah is second to none! So it should hold true that the Crimson & Clover will be fantastic since it is a blend of 50% Petite Sirah, 25% Cabernet Sauvignon, 15% Syrah and 10% Zinfandel. Well, we always give credit when credit is due, but the honest truth always lies in the pudding… or the wine I should say. We opened up this bottle for a leisurely glass of wine and a bit of Dubliner cheese. In the glass, it was a bright clear garnet color with long burgundy color legs. On the nose, dark fruit, nutmeg, and even a bit floral. Very pleasing on the palate; very rich with lots of blackberry, black cherry, and some brambly spiciness in the back palate. It even had a mid palate chocolate but a hint of vanilla on the finish. The mouthfeel was soft and creamy, but bursting with fruit and spice! We really enjoyed this wine and think it is a perfect wine for the new American palate. Lots of fruit, soft spices, and a soft finish. We like our wines a bit edgier and provocative but this is a wine we would buy again…and you can’t beat the price at $9.99 a bottle! So we give this an 89 on the SiNoTas scale. It’s the Trifecta on the softer side of our palate! WineSplashing!!! Learn more about their wines at www.ConcannonVineyard.com.